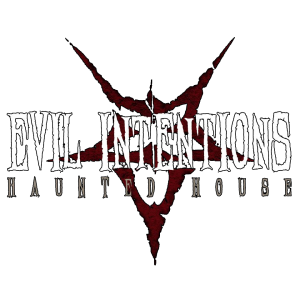 Evil Intentions Haunted House is a Haunted Attraction located in Elgin, IL. Team White City Devils reviewed this Haunted Attraction on September 22, 2018. In 1899, Elgin Metal Casket Company was known for producing some of the most sought-after caskets of its time. Over the years, the building has suffered from multiple reports of unsolved murders, unexplainable anomalies, and cult activities. This building now houses Evil Intentions, a haunt that lives up to its name… in more ways than one. The stories behind the building are displayed throughout the haunt and make you feel like you’re dead center in the middle of the reported murders and cult activities. On any given night, there are 60 to 70 actors that bring this haunt to life each night. Even with a crew this size, it was impossible to find a single one that didn’t take their job seriously. What’s amazing about the cast at Evil Intentions is how interactive they are, either to us (verbally and/or physically), or in use with their environment. Some of the characters are based on actual events that have taken place in the building, which adds on to the creepy factor in a great way. Another actor who was a doctor/dentist had a knife literally at our throats asking for one’s teeth, and another one of us for our skin. Besides the mentioned highlights, other cast members were all equally high energy, and it shined through in their valiant performances. Costuming for the actors was of high quality and really felt like they were all custom-made for the theme of the haunt. This allowed the characters to follow the stories of the building even better. The cult characters were placed in black robes and had symbols on their faces. When they were close enough we could see colored contacts that added a nicely-glazed-over look to their already-fiendish appearances. Above us at one point was a robed Baphomet, menacingly calling us over with a simple curl of his finger (well… bone, actually)! The costuming here really added to the overall effect of believing that what we saw was real, and really made us feel as if we were right in the middle of a cult gathering. Evil Intentions is not hard to find. We were instantly able to tell we were in the right spot from a black bus in front with its namesake on it. They also had a giant video displaying on the side of the building, loud music, flashing lights, and actors running around the street and chasing passing cars. Parking is conveniently located across the street, with additional parking available on the street side. There are restrooms available throughout and an awesome merch table at the end. All of their additional info can be found online with ease or questions can be answered by their professional (and very friendly) staff at any time while you’re there. When we exited the haunt and approached the merch table, we heard the group right behind us say they’d had a group member lose their phone inside the haunt. As it turns out, Evil Intentions’ staff was able to find it quickly and return it. We were also able to have a moment to talk to the owner after our visit, but our time was cut short because of a group causing trouble that needed to be escorted out. Of course, we understood and found it very professional of them to have taken care of the matter with such urgency. It quickly became obvious that Evil Intentions takes customer safety very seriously. 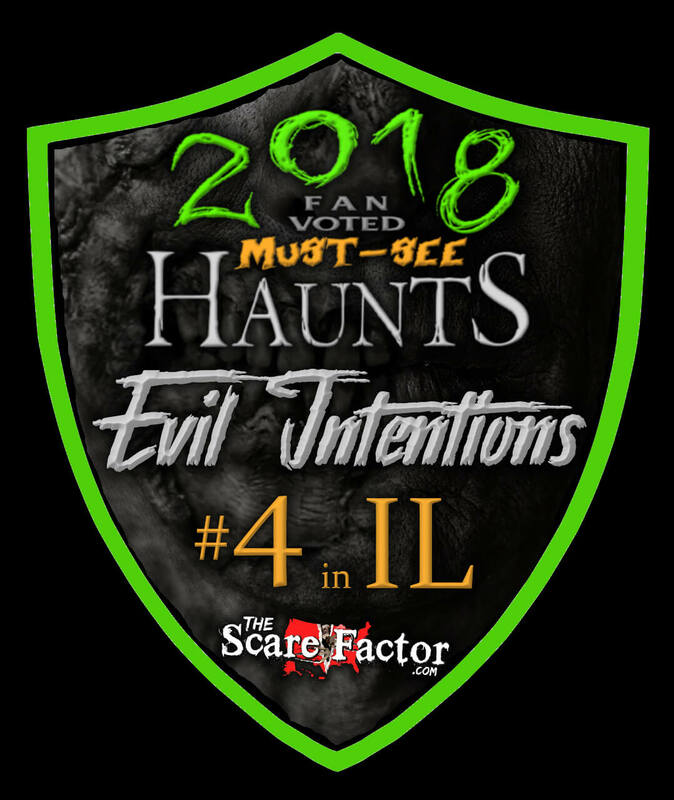 Evil Intentions has an atmosphere that’s second to none, hence the very high score in this category! They know the background of the business before them, as well as the history of the building, and it’s no coincidence that the haunt is where it is. There are plenty of caskets to see displayed while you wait, and many actors roaming about to keep you entertained. They did a great job of setting the mood for those in the ticket line. Videos of their ghost tours are played (which are available throughout the off-season) and actors continued to interact with the crowd to help pass the time and keep them entertained. When we were next in the ticket line, one actor knocked super loud and hard on the counter and ran away while the cashier was turned away, making it look like we were the ones who did it. It was an awkward but very great gag. Evil Intentions has a unique perspective on special effects. “Less is more,” here. They do not rely on animatronics or pressure pads, but rather the environment, lighting, and sounds and it really works in their favor! The scenes were original to the stories of the building and they really help solidify a realistic experience. Without giving too much away, there is a breakaway that leads to the front of a church scene. This is a physically colder part of the building, but with the sound of church hymns, dark lighting, and fog effects, it makes for a very unsettling feeling and is a great use of something as natural as room temperature. When we entered the church, the high altar was detailed well and had an extra touch of biblical pictures covered in blood. The details in each scene were incredible and, combined with being set with proper actors, they led us to believe they were real places and not just scenes in a haunted house. The room behind had a stage occupied by a picture (that didn’t stay a picture for very long) of a nun and pews that were filled with robed figures. We were cautious of who we stepped in front of, for fear of the figure being an actor and not just a prop. I could honestly go on and on, but its all fantastic and something you’ve simply got to see for yourselves. The theme of Evil Intentions is unique and stands alone. The stories behind the building are the theme of the haunt, and no one else will show you this particular setting. The owner did a great job at telling us the background that brings the haunt together and the way he set up every scene to match the stories. One of the things we look for is whether the haunt has an authentic location; it was impossible not to give them a 10 for this question! Items were on display that they allegedly found in the building with small descriptions on each one. I feel the items are overlooked by most, but we took the time to check them out and found that each one ties into the haunt at some point. If you have a chance to check these out for yourselves, it delves you into their realistic scenes and themes that much more! We cannot say enough about the originality and creativity of Evil Intentions. 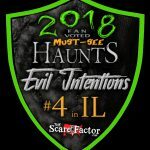 Evil Intentions is one of the more realistic haunts we have had the privilege of attending. From the moment we entered the very first room, we were hesitant by what we saw. We instantly questioned whether or not we should proceed further. Then, add together the details in each scene with the outstanding cast, that wouldn’t break character no matter how uncomfortable we felt, and you’ve got one of the most intense haunts around Chicago! Everyone in our group all had their own moment of panic and extra fright; each of us became a target at some point throughout the haunt. The scares were unpredictable and enough to actually keep us freaked out for most of the way through. We experienced a great variety of scares that ranged from great verbal interaction, close pop-up scares, tight spaces with actors, and even a coffin-shaped maze that was difficult to navigate. As we made our way closer to the end of the haunt, they had us feeling like we had entered a heavy metal video. It did kind of change the pace of things, but this didn’t take away from any of the other aspects of the haunt; that made it truly something of a fright. We attended on opening weekend just for fun. We actually had no intention of visiting for review purposes, but this haunt really deserves an official review. Evil Intentions is absolutely worth the visit and they offer a great value to boot. General admission is $25 and VIP is $35. Early in the season, you may not wait in line long, but in mid to late October, you may want to invest the extra 10 dollars for a fast pass; waiting times can be hours, with lines that extend around the block (speaking from experience of last year). It took our group just over 28 minutes to tour the haunt, leaving the Minutes of entertainment Per Dollar spent (MPD) rate at 1.12 which makes this attraction WELL worth it. Evil Intentions is an actor- and set-driven haunt that simply does their job very well; it really is as simple as that. The space they use is well thought-out and it shows throughout the entire haunt. We were invited to join again before the season ends, and we are definitely heading back! *Fun side fact- Evil Intentions also may have access to placing a haunt in the old Joliet prison. If they were able to pull off such an impressive haunt with the background of the casket company, we can only imagine what they would do with a place that once housed many criminals, including John Wayne Gacy.